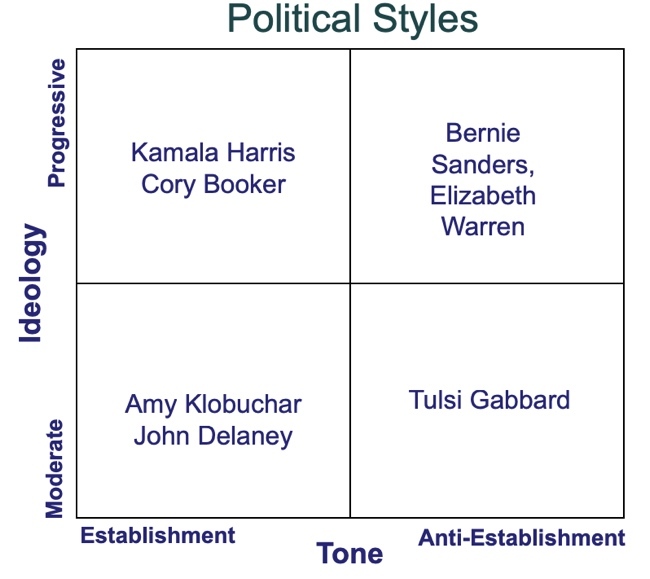 Writing about 2020 Democratic candidates on the FiveThirtyEight web site in January, Nathaniel Rakich makes the observation that “Really, party divisions unfold along two dimensions: ideology (progressive vs. moderate) and tone (establishment vs. anti-establishment). One of his points is that this is a far better predictor of primary success than strict ideology. Voters are in an anti-establishment mood, in the United States and in other countries. And, voters are often willing to vote for a candidate who may not agree with them on all positions if they are more in tune emotionally with the candidate’s tone. At least three times in the late twentieth century anti-establishment candidates played a role in election outcomes. In 1968 third-party candidate George Wallace’s rabid campaign message struck a chord in southern and blue-collar midwestern states, and probably denied victory to Democrat Hubert Humphrey. In 1980 Reagan ran as a strong anti-government outsider and defeated Jimmy Carter, who also had run as an outsider in 1976. In 1992, Ross Perot fired up nearly 20 percent of voters in his independent quest for the Presidency, damaging the campaign of George H.W. Bush and helping to elect Bill Clinton. The dilemma for candidates is that the path to victory in politics is to build a big coalition; there is power in numbers. Trump won a victory in 2016 that was surprising—perhaps even to him—based on animating and aligning many different interest groups, from Reagan Democrats to pro-lifers, and Tea Party anti-tax voters. Establishment Democratic candidates next year must answer the question of whether they can adjust their tone to appeal to anti-establishment voters while bringing the moderate and traditional establishment voters along with them; or whether they will suffer the fate that befell Republican establishment politicians in the runup to the 2016 election.